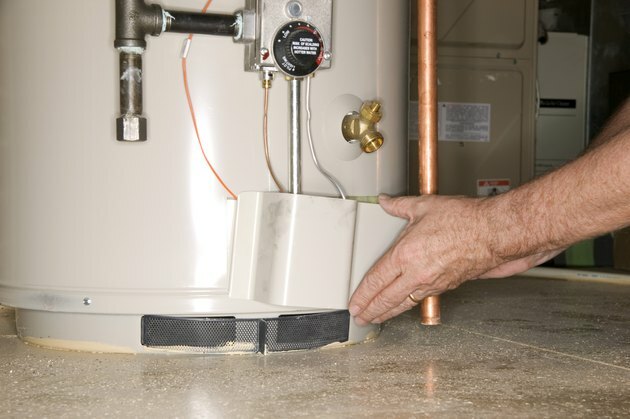 Replacing a hot water heater element is usually a straightforward task. The most common type is a screw-in. Excessive heat, sediment and rust sometimes adhere the element threads together. A stuck element will not turn with a standard wrench or vise grips. You'll need a six-point socket set with a 1/2-inch drive socket wrench. The large socket wrench gives more leverage, and the socket fits securely over the heating element. A breaker bar is sometimes necessary as well. Breaker bars are hollow steel pipes that fit over the socket wrench handle. They give the extra leverage necessary to remove stubborn bolts and stuck heating elements. Bend the heating element wires out of the way. Cover the thermostat below the heating element with a rag. Mix a solution of half vinegar and half water in a small cup. Dip a toothbrush into the solution and brush it between the seam of the heating element and the side of the heating tank. Apply the solution liberally, but do not allow it to drip heavily. Allow the solution to sit for 20 minutes. Place the socket over the heating element and attempt to turn it counterclockwise. Tap the handle of the socket wrench with a hammer to get the heating element to begin turning. Slide the breaker bar over the socket wrench handle if the heating element will not budge. Ask a friend to hold the top of the socket wrench over the heating element while you turn the wrench with the bar. Remove the bar from the socket wrench handle once the heating element starts turning. Continue turning the heating element with the socket wrench until it is completely out of the hot water tank.